Liz knew her science fair project would be great. Her teacher told her how if you take a picture of the sun at the same location and time every day, and then put them together, you could see how its position made a figure-eight pattern over the year. So every morning, Liz faithfully trudged out to the lake and took a picture of the sun until she had a year’s worth. Then she layered the pictures atop each other. The sun formed a pattern alright. It wasn’t a figure-eight, though. Liz made out a message: Going Nova. Goodbye, Cruel Worl–. I’ve cheated a bit today. Analemma isn’t a medical term. It’s an astronomy term that refers to the figure-eight shape created when you track the sun’s highest point in the sky throughout the year. The sun’s not really complicit in this process at all; it’s the earth’s elliptical orbit that creates this effect. 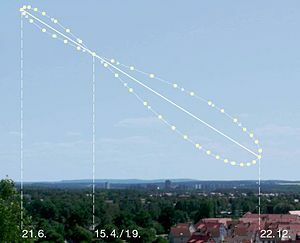 When I first saw a photomontage capturing the analemma, I immediately thought of skywriting. Wouldn’t it be interesting if someone trying to document this effect discovered that someone was trying to send a message? Although it’s not scientifically accurate, I decided to write about the sun’s very slow efforts to warn the Earth about its own impending death. Maybe the sun’s lost the will to live after eons of being ignored by the planets in its solar system. Nonetheless, we’d best get a move on before the sun finishes its suicide note, or risk going up with everything else in the nova. It’s a lonely universe for sentient stars. Are you interested in astronomy? I’m slowly becoming addicted, thanks to the superb Bad Astronomy blog, written by astronomer Phil Plait (who I also admire for his pro-vaccine activism). Check out his blog for some really stunning pictures and reams of well-written information on astronomy for amateurs and the experienced alike.